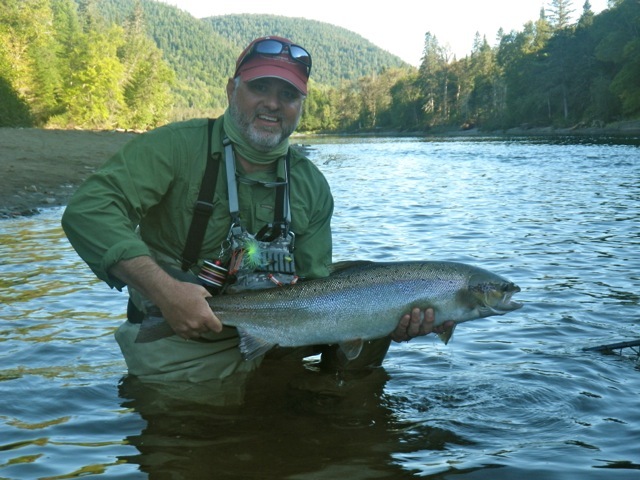 September is a great time to be on our rivers, it brings cooler water, usually some rain and defiantly a nice run of fall salmon. The first second of September hasn't disappointed us in the least, we had some great fishing over the past week and managed to land a good number of nice salmon including a couple of big ones as well. Last weeks full moon and high tides brought a good number of fresh salmon in our rivers. 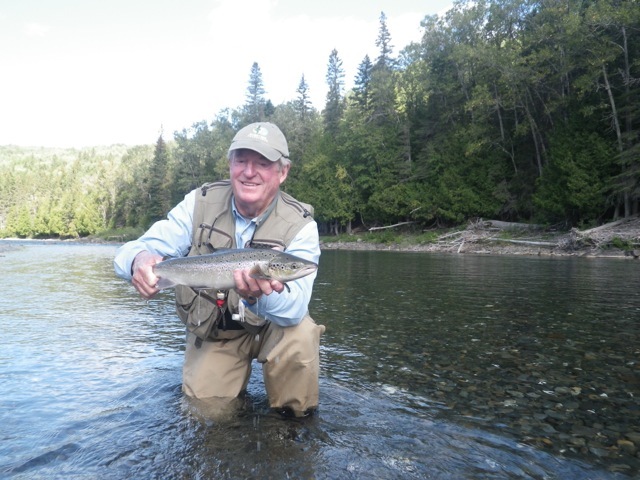 Larry Godfrey Lands his first Grand Cascapedia salmon, Way to go larry. The Bonaventure is low but still has plenty of water for our fall run fish to enter. We are seeing a good number of bright silver fish in our pools. The water temperatures in the Bony are perfect. The Petite Cascapedia is also experiencing low water and fish are stacked up in four pools. We need some rain to move them around. We've been limiting the number of rods on the Petite to keep the quality high, but those who fish it are doing well. The Grand Cascapedia is also seeing a nice fall run, the lower pools especially have been producing well. The upper sections are very low and we really need some rain. 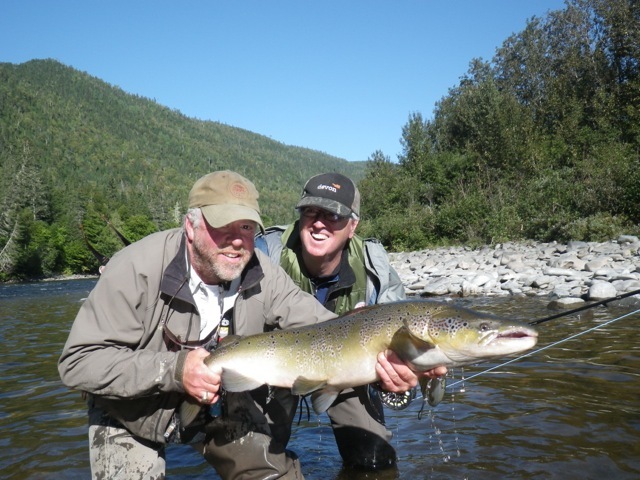 Matte Schouten with Salmon Lodge guide Yvan Bernard, nice salmon Matthe! As I'm writing this weeks report the rain is coming down hard. The weatherman is calling for 25mm between today and tomorrow, lets hope. 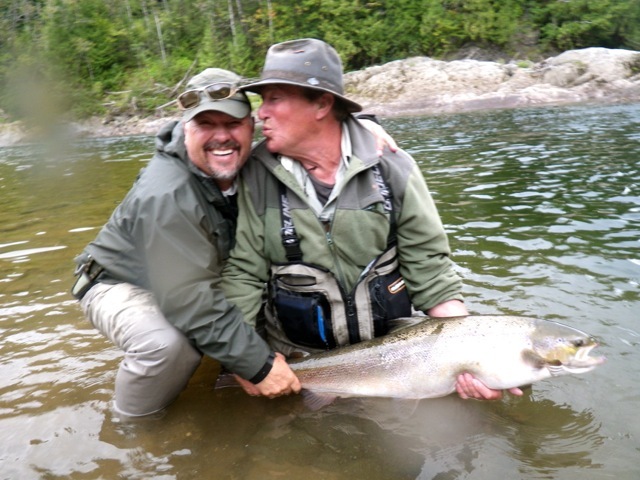 John Johnston and salmon Lodge guide Larry Dee put a nice one back in the Grand Cascapedia. This week hot fly's have been the Red Francis, the Red Francis and the Red Francis! Most of this week fish were caught on it fly. The ally shrimp along with the Silver Rat were responsible for a few more. Dry's are still working especially the blue bomber. Braden Beck lands a nice grilse from the Bonaventure, a good way to begin the week!